Born in Seoul in 1974, Moon So-Ri majored in Education at Sungkyunkwan University and first acted on stage in 1996. She had appeared in only one short film before Lee Chang-Dong cast her as the female lead in his feature “Peppermint Candy” — a role which made her famous in Korea. She returned to the screen (again opposite Sol Kyung-Gu and under Lee Chang-Dong’s direction) in “Oasis”, and currently, her acting titles are more then 30. Since 2014, he has been working as a director, with “The Running Actress” being her first feature. 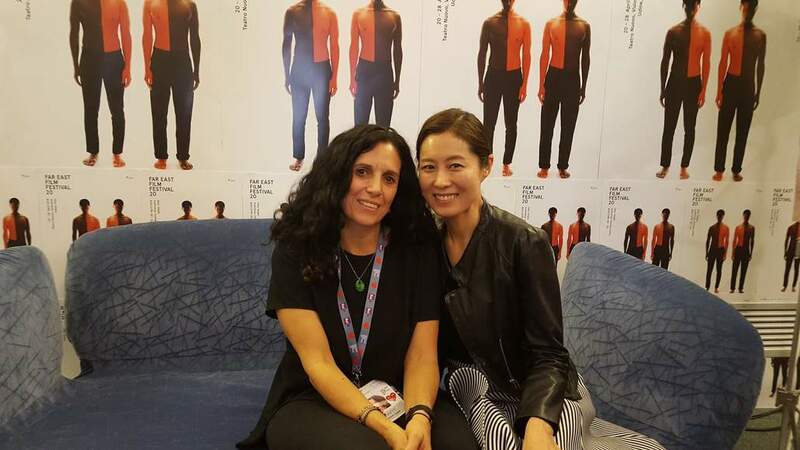 On the occasion of her film screening at Far East Film Festival, we speak with her about going back to the university, Marcello Mastroianni, running in high heels and the double role of actor/director. “When people outside of South Korea see a Korean movie with scenes of people drinking soju, they always think it’s an Hong Sang-soo’s movie” Moon So-ri says, smiling. And you can imagine her drinking with Hong Sang-soo and talking about her movie. Did you show him the script by any chance? No, I didn’t show him the script beforehand but there is a big difference between me and him and it’s that after a glass of soju, I have to go home and go to bed (she laughs). Of course, I have worked with him a few times as well as with other directors that have surely influenced me and taught me a lot. Can you tell us the director that had the most significant influence on your career choice? I have been working with several big directors but if I have to mention one who was really influential I would say Lee Chang-dong. He is the one that started my film career with “Peppermint Candy”, my debut as an actress. I’ve learned a lot from him, like a child learning how to walk or eat. So, while I was making my film I thought about that experience with him, a lot. When I was working with him on “Oasis” he was hard, even sadistic at times but he taught me to take the plunge. You need lots of courage for directing and making decisions, and I feel that he gave me that courage. You have mentioned the wonderful “Oasis” that showed your talent to the world. How did you prepare for that difficult role of a disabled girl? The preparation for “Oasis” was very long, six months first and then six more months of filming. At the time I was studying pedagogy and I was working with disabled young people that wanted to attend university, I was helping them to study for the admission exams. I spent lots of time with two disabled girls in particular and we eventually became friends. For the role in “Oasis” you won the prestigious Mastroianni Award at Venice Film Festival. What is your recollection of that moment? When I received the Mastroianni Award in Venice many years ago, I hadn’t understood the reference, as I didn’t know who Mastroianni was. Then I realised, he was the same actor I had seen in many Italian movies and I appreciated the Award even more. Much time has passed but still now Marcello Mastroianni is like a protector for me; he is looking after me from the sky, like a guardian angel, always there in my difficult moments and when I need comfort. I really loved him in “Otto e 1/2” and his struggle as director (he interprets Fellini, in the film) really resonates with me, now that I have started as a director. I have been four times in Venice already and every time I want to go back. In Udine it’s my first time and I really hope to come back again. When did you understand it was time to try directing? I have been working in this industry for a long time, always with passion and I wanted to expand myself beyond acting. So I went back to study, I got a Master’s degree and finally decided to try directing. When I started studying cinema at the university again, I didn’t have the clear plan of becoming a director, I just wanted to dig deeper into the cinematic universe. Then everything happened gradually. That university break, after years of frantically working and acting, has been a way to dedicate time to myself. It was regenerating and therapeutic in a way, and the best fruit was the completion of this film. The movie is autobiographic and you decided to use yourself as actress and keep your own name for the protagonist. Why? I have used my name for a precise purpose. Usually actors are perceived as the characters they interpret at the point that they even struggle to understand their own identity, but we are human beings like everybody else. I wanted to see myself from afar, in a more objective way and I wanted to show that apart from an actress, I am also a woman, a mum, a person with a normal everyday life. And how was the experience of being both an actress and a director? Having a double role was unusual. When I was just an actress, the first thing to do on set was the make-up, but now I wasn’t sure where to start, going behind the camera or briefing the staff. But the funniest thing is that while I was acting – having to direct at the same time – I was saying “cut” to myself. It was weird but also interesting. The film is titled “The Running Actress” and in the poster you are on a running track, glamorously dressed. What does “running” as a metaphor mean to you? There are many ways to go through life, sometimes you run, sometimes you fall, sometimes you rest. If I think about my past, when I was in my twenties and thirties, all I can think is that I was just focused on running. With the title I wanted to express this idea and also – as an actress – sometimes I need to look glamorous and I have to run in high heels. An actress can’t run in shorts like everybody else! Your movie is about the struggle of an actress but also about the struggle of a woman. Moreover in your acting career, with your not-mainstream roles and characters, you have given voice and power to Korean women. Will you carry on directing and will you narrate more women stories? Nothing has been decided yet, one certainty is that I enjoy everything in filmmaking, it can be acting it can be directing or producing, whatever, as I really enjoy the process. Next film could be about myself, about women, sexual minorities, I don’t know, sometimes, like in my movie, I didn’t have the chance to act (note from editor: she means while she was directing), but now that I also directed I want to enjoy every side of making movies, but nothing certain has been planned. In your movie, I can detect a hint of criticism to modern Korean cinema when a character mentions that “now it’s all gangster movies and there are no roles for you”. Could you tell us what you think about Korean cinema in these recent years and if you think there is something missing. Nowadays, the investments and investors are the most important thing in the industry, so we have many blockbusters and we can say we haven’t got a huge variety of genres, but compared to other film industries in Asia we do have variety. I would like to work in different genres and projects. As an actress, you always worry about the future so you have to make whatever you can, that is why I made this film and I now want to expand to different fields. In a scene of the movie, at the funeral wake, your character talks about the dead director and badmouths him. Are you worried about your legacy, about being judged by other directors? I believe it is the audience’s right to utterly criticise movies, even the masterpieces, so it is very likely that your own work is criticised by the public, but making my movie I thought it is very important to have a certain attitude among the peers and the people you work with. You have to understand each other deeply, become each other’s best friend and especially, you have to respect other people. This is very important for me. Audiences can say whatever they want but among the peers you have to be supporting. That funeral episode ends with an homage to “Bicycle Thieves”. Can you tell us the reasons behind this choice? I thought a lot about that scene, I wasn’t sure what film I wanted to use, the more pertinent to that moment. Finally, it was a natural choice, as it is one of my favourite movies and I think the right one to show to a child in that specific moment of the loss of his father. That is a very moving, silent moment in the film, however In “The Running Actress” there are quite a lot of chats and dialogues. Are they all following a script or did you leave something to the improvisation of the actors? No, no, there is nothing left to improvisation, dialogues were all written thoroughly. I didn’t feel confident enough to do otherwise and also, there were few non-professional actors within the cast. But in my next film, I would like to introduce more improvisation, gradually. And within the cast there is also your husband (director Jang Joo-hwan) who appears briefly as himself. Was it difficult to convince him to act? At the casting stage it was really difficult. Until the day before shooting he was adamant he didn’t want to do it. But I really wanted him, the role was really cut for him, with his natural gentle attitude, it had to be him. So we stroke a deal, I promised I would’ve filmed him only from behind, never on the front and he finally agreed. Then, once on set, I saw that he was having the make-up done and I asked him why. He answered that – being a director himself – he knew directors are untrustworthy and that there were good chances I would have broken my promise (she laughs).